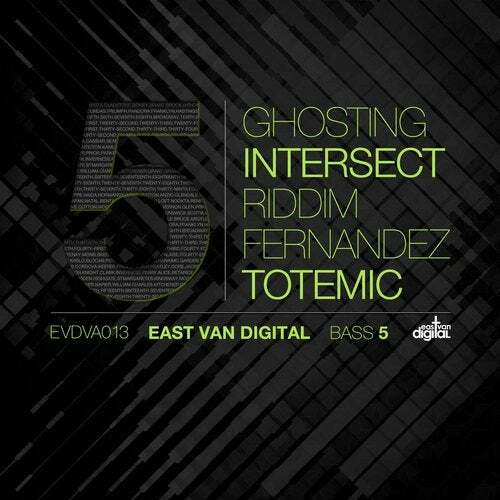 Tapping the likes of Totemic, Intersect, Riddim Fernandez and Ghosting, East Van Digital's most rib-rattling compilation series went large for its monumental fifth installment. Toronto producer and soulful drum and bass specialist, Doug Penny's Totemic contribution to this compilation drips with intrigue from its first pensive note. Its percussion flirts with drum and bass as the bassline alternates a slow Morse code, and its unhurried melodic fragments haunt the spaces in-between, hinting at the understated tension of its atmosphere from the fringes rather than directing it outright. It shows without telling, the perfect track to set the mood for a gritty, spy-laden, contemporary film noir. Formerly of the infamous Wassabi Collective, Nelson-based duo Rahj Levinson and Scott Milne follow through on their project's name. Intersect's sound refuses to be locked down by any single genre. Their love of lower frequencies finds threads between half-step drum and bass, UK dub, and trap to all things bass. For example, "Mouse Trap" has a big stepping beat and, as you might have guessed, trap percussion, but it is taken somewhere else by its effervescent quasi-new age melodic framing, like a friendly giant in fat pants and oversized yellow sunglasses spinning poi. It gets down but brings you up, resolving any and all internal conflicts the listener may be experiencing at the time. Hailing from Barbados, but reared in Toronto and currently calling Whistler home as a high school physics teacher, Riddim Fernandez knows how to drop science. He draws on funky island beats, jungle and '90s hip-hop to synthesize his sumptuously mellow take on dubstep in "Neutron Weight Dub." This track sees Fernandez usher in a keenly metropolitan style, a sophisticated sound worthy of a big city cocktail party, yet grinding out bass worship to drop dancers to the dirt in the woods. It assimilates familiar reggae tropes, channeling them into a truly contemporary setting underscored by a carefully paced, swirling pad and a prickly bassline. This is one to get low to, and swing that booty. Enigmatic art-puzzler, Ghosting (who may be lurking behind you as you read this) paints the silence with sound creations stolen from the altar of the Gods. His latest incantation, "Indigo Distortions" has a murky, percolating feel, like a sentient swamp waking from slumber in the distant future. Little hints of dubby guitar and prickly static twang and crackle amidst the pulsing bassline that bursts forth from the ether, while faint industrial drones hum from one ear to the other. The replay value is high among these four cuts. If you don't just like, but need bass, this is the fix of your fantasies. How Can You Just Pretend?